The natural follow-up question to my last post is, “Sooo, how did you meet?” A good question that I intended to write about sooner. Sorry to keep you in suspense! Amanda and I were both involved in a certain youth ministry in Texas. We were there several years apart, though, so never knew each other until an Ughbook group put us in touch. I do not really recall interacting with her in the group, but I also was not in there frequently. In early April, I received an Ughbook message from her, asking if I had participated in a particular program, and if I had been on some crazy bus trip where they broke down several times. I wrote back that it wasn't me but that coincidentally, I did have a crazy bus story of my own. We started exchanging a few messages talking about our experiences and realizing we had some friends in common. Come May, we moved from Ughbook messages to instant messaging. We got along well and had fun chatting, but honestly romance was the farthest thing from my mind. One of her favorite bands is Over the Rhine. I also love them and even though I have an album of theirs and have seen them perform, she offered to make me a mix CD of them. “I love introducing people to Over the Rhine!” she said. I gladly accepted more good music that I did not have yet. At some point I found out she was not really familiar with Jimmy Eat World. What?? I know, right?! I planned to return the favor and send her a Jimmy Eat World mix. We started talking about how this would work. I figured I would go down there to meet her soon, but I did not have a grand date plan . . . yet. Something reminded me of the Schlitterbahn water park I had been to years ago. I looked it up and realized it was only an hour away from Austin. Amanda had not been before, but it was on her list. Unfortunately we both had busy schedules and Labor Day weekend (almost two months later) was the first time that worked out for both of us. We waited patiently and got more excited as the date approached, of course. The night of my flight came and a really bad storm hit Chicago on my way to the airport. First my flight was delayed an hour, then it changed concourses/gates, then it was delayed several more times. This was torture. Finally there was a plane, pilot, and crew, and we were off to Austin! Austin airport was an eerie ghost town at 1:30AM. 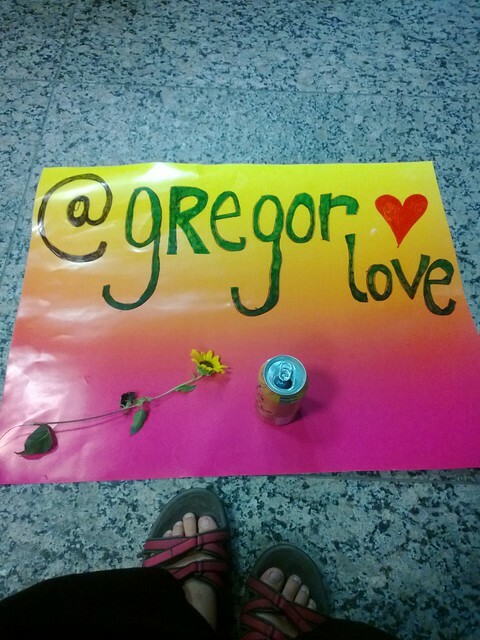 I came down the escalators and saw her holding this large posterboard sign she had made that read “@gRegorlove” with a big heart. Then she turned it over and it read “Yes! I will go to prom Schlitterbahn with you!” And she gave me a small sunflower, which is a little joke going back to our youth ministry days. There was a big, long hug. Our Schlitterbahn date was great fun and we got along just as well in person as I had expected. Towards the end of our day at the water park I alluded to a second date (which I was sure I had in the bag). She coyly said “maybe” and something about maintaining her feminine mystique. I had gone into the weekend with the plan that if it went well, I'd ask her to be mah girlfriend. So that evening I did just that, and she happily said yes! D'aww. And that's how it happened! She's visiting Chicago at the end of October and I'm looking forward to introducing her to my mom and several Midwest friends. Update 1: Forgot the picture! This was so fun reading again. You make me smile ;) Also, my feet look so gross in that photo.